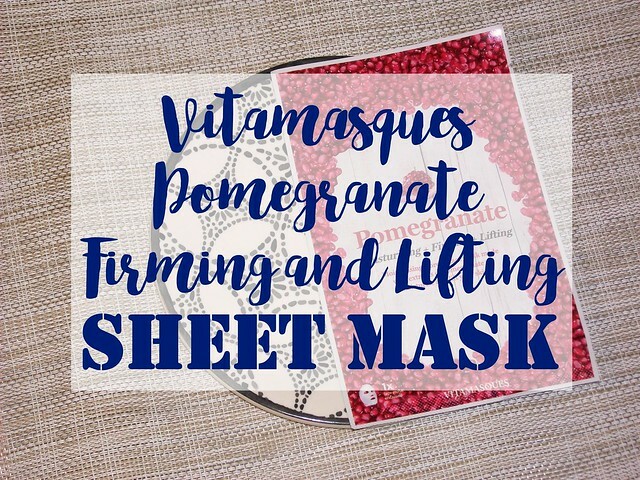 I feel like I've been slacking on the sheet masks front, despite them having become a real trend over the past year or so, so I was delighted to be offered the chance to try Vitamasques' Pomegranate Lifting & Firming Mask*. Sheet masks are super easy to use, as all you have to do is slap the mask onto your face (no trying to spread thinly in an even layer), let it sit for the specified time, and whip it off again! 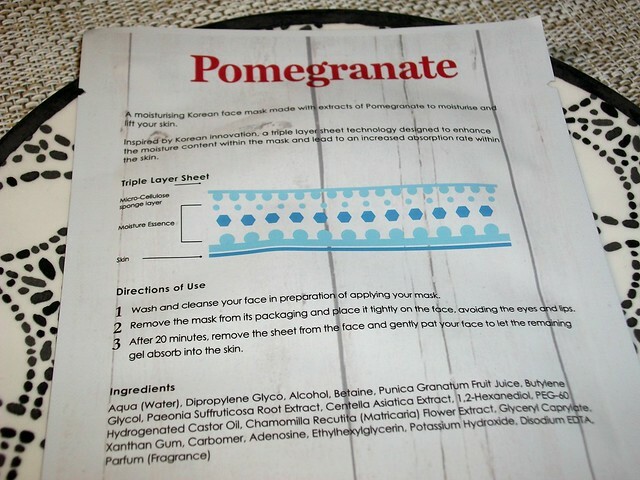 "A moisturising Korean face mask made with extracts of Pomegranate to moisturise and lift your skin. Inspired by Korean innovation, a triple-layer sheet technology designed to enhance the moisture content within the mask and lead to an increased absorption rate within the skin." Applying to a freshly-cleansed face, I found the mask felt quite cooling on the skin, and once I removed it after the 20 minutes were up, there was plenty of essence left on my skin to pat in. Once done, my skin was left feeling so well-hydrated and noticeably plumper and brighter, which wasn't even a claimed benefit! As I mentioned, I'm not really in a position to comment on the lifting and firming claims yet, although I suspect you'd need to use it more than once to see lasting results in any case. That aside, I did really like this mask as a hydrating, brightening treat for my skin, and I'd certainly be keen to try others from the Vitamasques range. You can find the Vitamasques Pomegranate Firming Lifting Mask on LookFantastic for £3.99 here, or pick up a box of four for £12.99 here to save a couple of quid. You can also check out the rest of the Vitamasques range here; I've got my eye on the Tea Tree Hydrating Moisturising Sheet Mask, also £3.99. Are you a fan of sheet masks? Have you heard of or tried Vitamasques before? They are hydrating but not sure if there is anything long term wise for benefits to the skin. I haven't heard of this product before but it sounds like I could benefit from a bit of skin nourishment - especially when the outside elements are harsh. Lovely review - I always go by recommendations so this is great! Mmm Pomegranate smells amazing! I always think sheet masks look so funny! (No offence, you don't look funny!) but i'd really like to try one myself! I used to buy these masks all the time when in china= i loved them! Would love to try a mask like this! 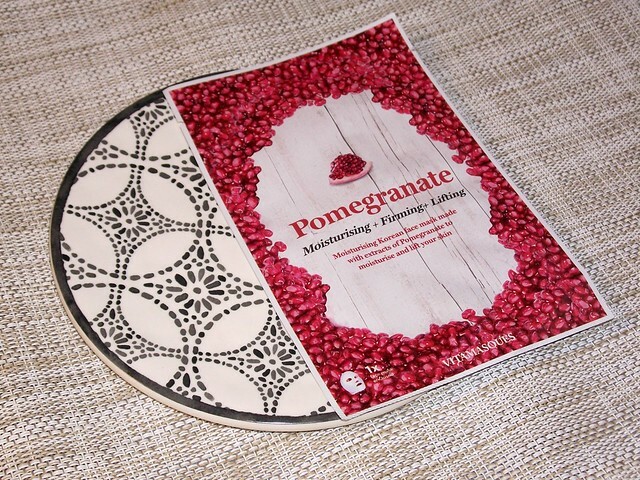 I love pomegranate so this is perfect. I loved this mask, but if you want to save money, try sephora's sheet masks.